It started with a fist bump. That was Robert Fraser and Daniel Coppock’s way of wishing each other luck before their big fight. A small crowd began to gather, pressing close to get a better view of the action. With $60 and the glory of being victor on the line, Fraser and Coppock ignored the onlookers as they turned toward the blocky ‘90s TV, gripping their GameCube controllers in concentration as the screen lit up with two large, bold words: “Ready. Go!” And the fight began. This is a weekly routine for the two. They meet every Thursday at Merchants Pub & Plate along with 30-40 others to compete in the local Super Smash Bros tournament. Fraser, 19, and Coppock, 18, are undisputedly the best players in the house, and nearly every week they find themselves going head-to-head in the grand finals. This childhood game had become a competitive sport that brought them together. Super Smash Bros is a fighter video game that was first released for Nintendo 64 in 1999. The game got so popular it resulted in three sequels and a worldwide competitive scene that somehow found its way to Lawrence. Twitter, Instagram, Facebook, you name it–Gail Shafton has tried it all. But none seem to work when it comes to recruiting young adults. Infopgraphic by Callie Byrnes. Information from the Pew Research Internet Project. The lack of interest in activist causes by younger adults is a widespread problem. As activist groups have attempted to recruit younger people into their organizations, it has become apparent that Millennials are part of a new generation of citizens that do not engage civically the same way that generations from the past have, according to a report by the Pew Research Institution. Activist organizations have taken the backseat for Generation Y. In the 43 years that Larry McElwain owned the Warren-McElwain Mortuary, he didn’t worry much about cyber thieves hacking customer information. He said that most people couldn’t charge enough credit to pay for his funeral services on their cards, so it never crossed his mind that it could be a big problem for businesses around the world. It wasn’t until he took his granddaughters to a restaurant in San Diego and had his own credit card information stolen that he began to realize just how important credit card security is to customers and businessmen alike. Information from The Hartford. Infographic by Callie Byrnes. Although big companies such as Target and Home Depot are under fire for large-scale information hacks that have compromised millions of customers’ credit card information, small businesses are becoming the targets for cyber thieves and data hackers. 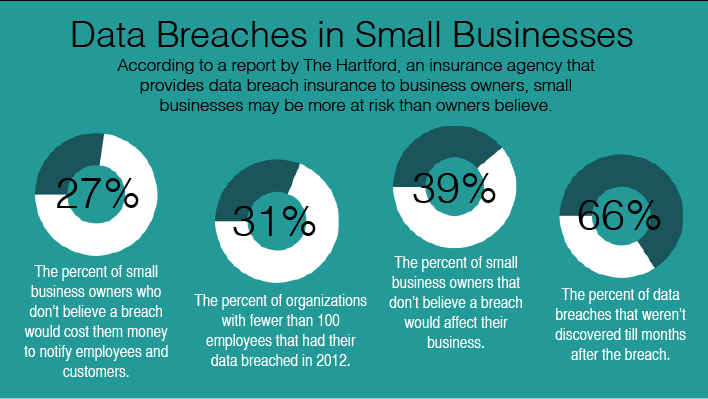 According to the Wall Street Journal, the switch to computerized records and digital systems have made small businesses the main target for system hackings. However, with the larger hackings overtaking the news, the danger of information compromises in small businesses is often overlooked. Read more the story here.